Better late than never - right? I love to decorate my house for fall. 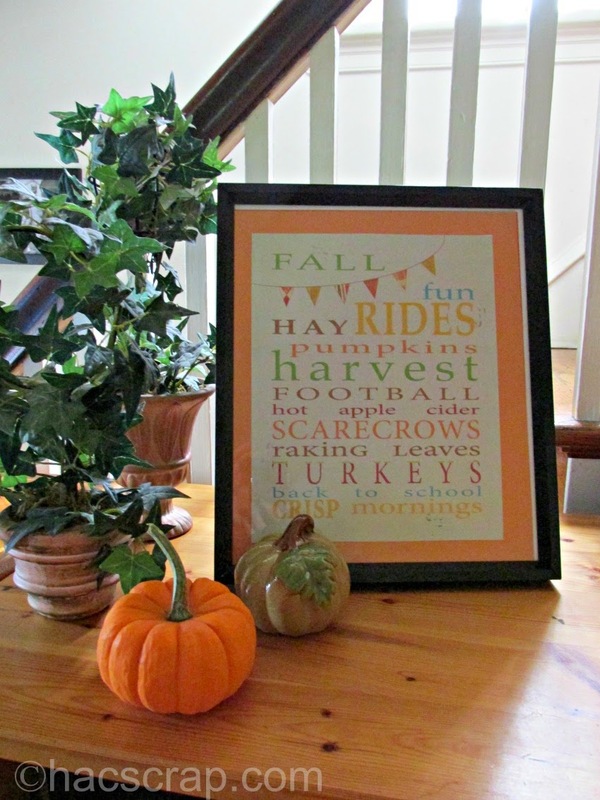 Fall is my favorite season and I like to go "all out" in my home decor, but still keep is simple and casual. I actually do three layers of fall decorating. The basic pieces are going to be up from October 1st (or earlier) until Thanksgiving Day. Then I add in "Halloween" pieces, like ghosts, jack-o-lanterns and my Trick or Treat Banner the week before Halloween. Those things come down the day after Halloween, and I put up some Turkeys and Corn that I have. 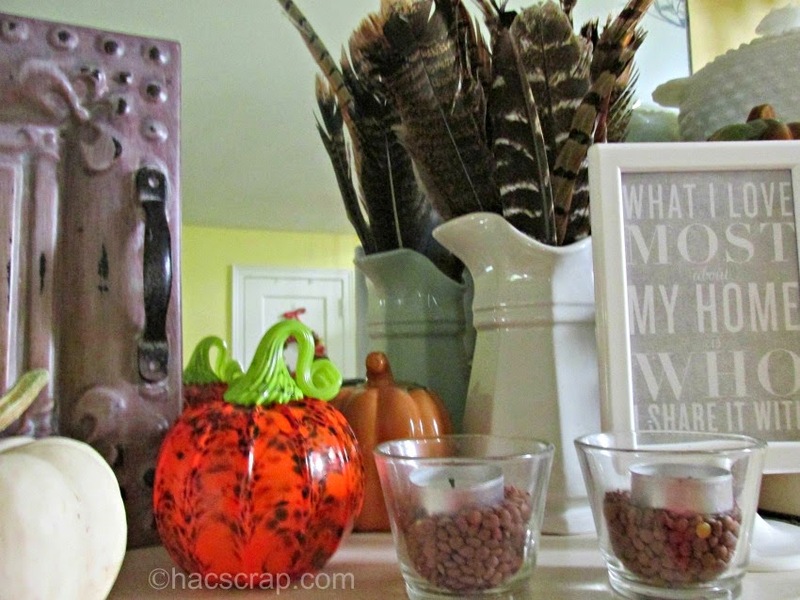 One of my favorite ways to decorate is with real pumpkins and gourds. These are pretty inexpensive and easy to find. As soon as they come out, I start buying a few each trip. I like white and traditional orange pumpkins the most, and they all need to have a nice stem. Owen collected a bunch of acorns on a recent outing to a local state park. I put them all in a Dollar Store glass vase, and wrapped some twine around the neck. 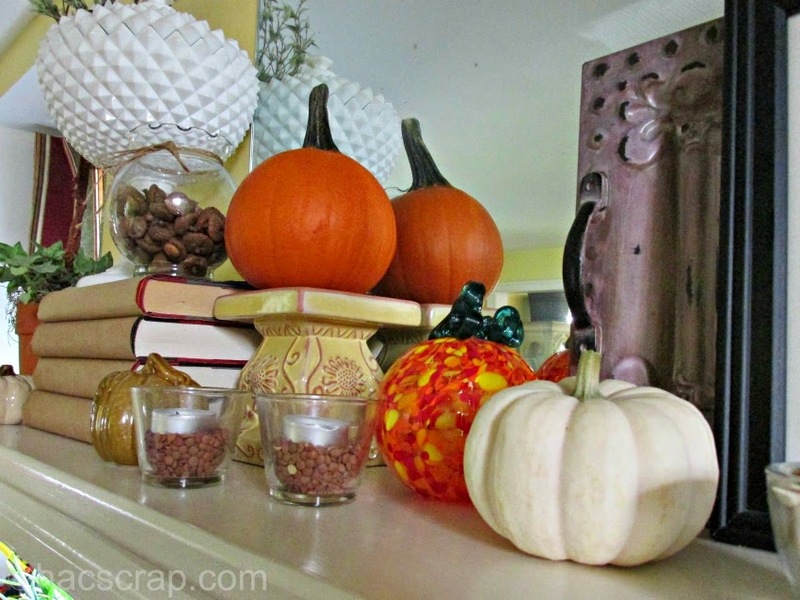 Another example of inexpensive and easy fall decorating. My parents have a flock of turkeys that live in the field behind their house, so the kids find a lot of turkey feathers in their yard. We collect them, and display them in my grandmother's iron stone pitchers. Last year, we took a family trip to the Corning Glass Museum, and Ryan made a blown glass pumpkin. I bought one from one of their glass blowers as well, and these are a great addition to my pumpkins - they can really catch the light on a sunny day. Those are lentils in my votive candle holders. Coffee beans add a nice rich brown color also. You can find some great free holiday printables on the web. One of my favorites is subway art. Each season, I find one to put in this frame. I've also collected small ceramic pumpkins from the Dollar Store over the years, and I spread these around on the mantle, tables and book shelves. 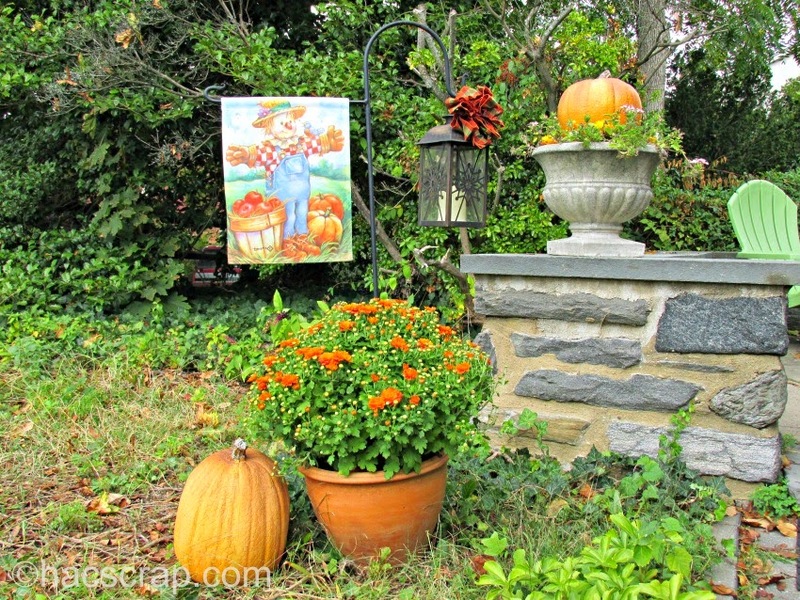 Outside, I use a combination of real and fake pumpkins and mums around my front porch and walkway. As much as I dislike using fake pumpkins, the real ones sometimes rot before the season is over OR the squirrels eat them. On Halloween night, I add luminaries and jack-o-lanterns for a spooky touch. 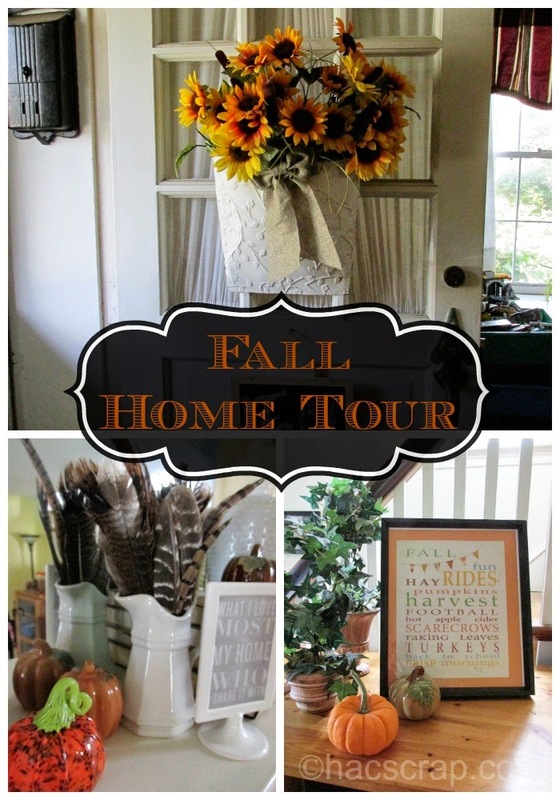 So there's a quick Fall Home Decor Tour of my home. I like to keep it simple with traditional colors and objects. I'm planning to add some touches of burlap, so I'll keep you posted on any updates! I may even try covering my own pillows! north face homme pas cher north face france Oncle Seven, laissant mon examen d'entrée universitaire, nous sortir de mélanger l'école soit putain, quand faire les couteaux de blesser avant même de lire le texte, ou pour calculer un north face homme pas cher problème de mathématiques, ou calculée selon la loi de la gravité ne peut pas couper nos north face homme pas cher machettes les gens qui. pas cher écrasa The North Face Soldes sa cigarette doucement coquilles, mégots de cigarettes attirent une belle chute d'arc pour la poubelle Lou Zili. Fart, si vous allez à l'université pour north face homme pas cher connaître mes intentions, et quel sera votre enfant, quatre sont compétents dans une langue étrangère, ce que vous apprenez ne sera pas. La tête de l'oncle Sept sur ​​un north face homme pas cher pas cher tapoté rit un north face homme pas cher peu.